Mild spoilers ahoy, of course. Kiki goes out on her own, and the only thing she really knows how to do is flying. She starts a delivery service, and meets lots of people along the way. At some point, she loses her ability to fly and can't think of what to do. Eventually, the magic of flying comes back to her at a crucial moment. URSULA: When I met you, I got the inspiration to paint this picture. But you know, I can’t get this girl’s face just right. I’ve been waiting for you to come. URSULA: Well, I guess. Sit there a minute. Will you be my model? KIKI: But I’m not that beautiful. URSULA: (laughs) You have a fine face. It’s a lot nicer now than before. Now, sit there. That chair is okay. Raise your head a little, like you’re looking off into the distance. That’s it; hold it. Magic and painting are a lot alike. You know, a lot of times, I just can’t paint. KIKI: Really? When that happens, what do you do? URSULA: No, no. Don’t look over here. 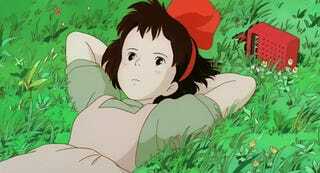 KIKI: Before, I could fly without giving it a thought. But now, I don’t know how I did it. URSULA: When that happens, all one can do is struggle through it. I draw and draw, and keep drawing. URSULA: Then I stop drawing. I take walks, look at the scenery, take naps, do nothing. Then after a while, all of a sudden I get the urge to draw again. KIKI: I wonder if that will happen? URSULA: It will. Hey, look to the side. URSULA: I decided to become an artist when I was about your age. I liked to draw so much, I almost hated to go to bed. And then one day, all of a sudden, I couldn’t draw anything. Everything I drew, I didn’t like. URSULA: I realized that my art up to then was a copy of someone else, things I had seen somewhere. I decided I had to discover my own style. URSULA: It’s still difficult. But then, the results…They seem to be a little better than before. URSULA: Then, witches don’t go around casting spells? KIKI: No, they say it’s just something passed on to offspring. KIKI: I never even thought about my magic powers. I used to think this training was just an old-fashioned custom…I was so happy you came today. If I were alone, I’d just be running around in circles. URSULA: You know, to tell you the truth, I thought about destroying this painting many times. KIKI: Even though it’s so beautiful? URSULA: When I met you today, and saw your distressed face, I thought, 'That's it', and I was inspired. URSULA: (laughs) Now we’re even. Travel is not the end-all-be-all of getting out of your element. You don't have to fly on your broom into an unknown city to get out of your element, either. You can try something in a different way, meet people you've wanted to know, or commit to something bigger than yourself. Many people, myself included, are fearful of getting out of their element a lot of the time. Kiki's Delivery Service has taught me that while it can be uncomfortable and painful to break from a comfortable routine, it can shape you in ways avoiding change does not. The story is told in a way that children can be engaged in, but the lesson is a very mature one to learn from. A criticism of the film that I am aware of is that nothing much happens. I know that it is a matter of taste, but I personally feel that a lot happens. Kiki enters a new town and meets important people in her life who help her during a personal crisis. She meets Osono and finds a home. She meets Tomo and finds a friend.Se meets Ursula and finds someone to inspire her. She meets the old woman listed as Madame and learns of the kindness of strangers. She meets the older woman's niece and learns of the selfishness of strangers. All of these people are important to her story, and we can only be so lucky to find people that provide these roles and teach the lessons that Kiki has learned. Kiki's Delivery Service is an example of a story where there are not many moments of extreme action, but there is still a significant story being told. Kiki's Delivery Service is a classic among fans of Anime. Being a Studio Ghibli production, it has breathtaking scenery and delightful characters that are considered a theme of Hayao Miyazaki's work. Miyazaki has been a sort of champion for female representation in anime. In Kiki's Delivery Service, viewers of all gender experiences are able to see a young girl represented in a relatable way and go through relatable trials. To the claim that guys can't relate to a girl's story, I would say that Kiki's Delivery Service provides a counter-example. This is a beloved tale among guys and girls alike. All kinds of people can learn from Kiki's story, and the fact that Kiki is a girl should not make the story only apply to girls. I would recommend to anyone who has not seen the movie to see it. There are plenty of places online to see it in English or in Japanese with subtitles.It's also available through Netflix(not instant) and Amazon if you so choose. If you have seen the movie before, but only as a child, you could perhaps learn even more by watching the film again. If you are not at all interested in the film or did not like it, then I guess there is not much I can or should do to change your mind. All I can do is shared the lessons that I have learned. They have helped me, and they could help you as well. * The conversation comes from this site, and I'm not sure if it's from the English subtitles or the English dub. All images are found from Google (mainly from fan pages and promotional images). By request, I can provide the sources at the end.